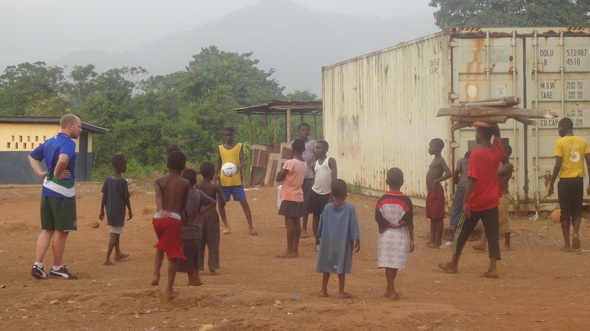 Posted on Sat, Feb 18, 2012 : 2:17 p.m.
Robbie Schulz, left, in blue, plays soccer with children in Sierra Leone. He brought 12 soccer balls with him on his first trip to Africa to give to the kids after hearing from his girlfriend that they typically use homemade balls. An Ann Arbor businessman and avid soccer watcher brought joy to a group of children in Sierra Leone when he brought them brand-new soccer balls to replace their homemade ones. Robbie Schulz, manager of the Alley Bar and part-owner of the new Live and The Last Word (formerly Goodnight Gracies), recently took a break from the Ann Arbor scene to visit his girlfriend Jenni Rousseau in Sierra Leone, where she works for a medical non-governmental organization. Schulz says the kids were happy to receive the brand-new balls. 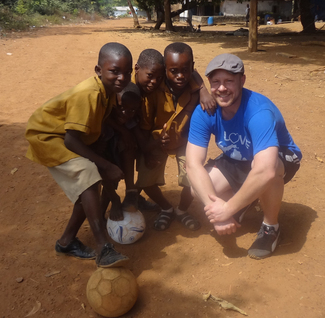 A soccer fan himself, Schulz had the idea to take some soccer balls with him last month on his weeklong trip to Africa for the first time. "My girlfriend tells me stories about kids playing soccer with homemade balls of paper, twine and other random items," said Schulz, who will turn 35 next month. His dad, Jim Schulz, contacted friend Tom Weinmann of School Tech/Wolverine Sports, which provides sporting goods and science equipment to schools. Weinmann and his boss, Don Eaton, put a plan in motion and School Tech donated 12 balls, one pump and a carrying bag at no charge. "It's to Robbie's credit that he put the time and effort into bringing the soccer balls," said Eaton. "Soccer is a worldwide sport of choice, and it's easy to transport balls in a deflated state with a hand air pump." Schulz says it was very rewarding to see the reaction from the children when he gave them the soccer balls. "It is amazing the joy something as small as a soccer ball can bring a kid," said Schulz. "I watched four kids play barefoot in an alley in Freetown for around 10 minutes. They had an old flat ball, but they were having so much fun. I knew right away that I was going to give them a new ball." Schulz tossed the ball toward them and says they were all smiles. "One boy asked, 'For me?' and I told them, 'For all of you. You have to share it.' He smiled one of the biggest smiles that I have ever seen and raised the ball over his head and started screaming and running up and down the alley. Seeing his reaction, I think I was happier than he was." Schulz says that kids play soccer in every alley, dirt patch and field available. "Soccer is very popular there with Manchester United (English Premier League) being the most popular club," said Schulz. "It is very rare that you find a household with a television, but every village has a tent with a television for watching soccer." As far as his impressions of Sierre Leone go, Schulz says that people there seem truly grateful for what they have. He says he would like to return to Africa soon. "Simple things mean so much more," he said. "There's no power unless you can afford a generator, no running water, and so many more things that would seem to cause stress, yet people genuinely seem to enjoy life. There's much more of a community feeling. Most importantly, people are grateful for what they have right now — peace in the country." 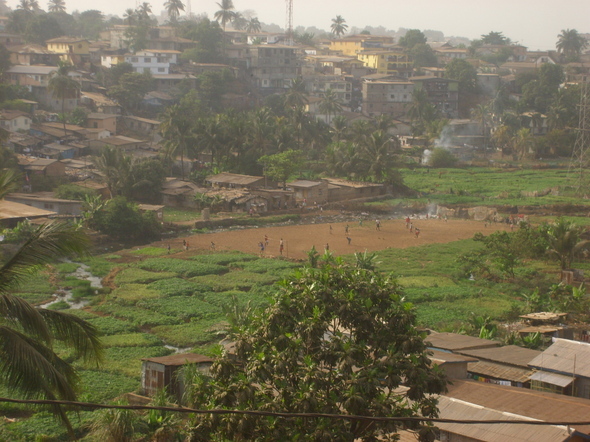 A view of the local soccer field. Sun, Feb 19, 2012 : 5:05 p.m.
A wonderful deed by a kind soul, Thanks Robbie for what you have done and as one from that side of the world who makes his home in the States as a naturalized citizen, It warms my heart to see the connection between the USA and Africa. I publish a digital online sports Magazine called African Sports Monthly <a href="http://www.africansportsmonthly.com" rel='nofollow'>www.africansportsmonthly.com</a> and would absolutely be thrilled to carry stories like this. Way to go Robbie! A wonderful thing to do. Thanks to Tom Weinmann and Don Eaton at School Tech for donating the balls, pump and bag that made this happen. Right now those kids are having fun. Sun, Feb 19, 2012 : 2:38 a.m.
What an awesome, kind thing to do! Sat, Feb 18, 2012 : 11:40 p.m. Wonderful! Rob is a friend and known to be generous. It is so refreshing to read an uplifting article. Nice reporting Lisa C.! Sat, Feb 18, 2012 : 11:08 p.m.
Love this story! It can take so little to make a profound difference in children's lives. Keep up the great work!! Sat, Feb 18, 2012 : 10:27 p.m.
Great article! Thanks for something so positive to read for a change! Sat, Feb 18, 2012 : 8:38 p.m. This was really nice of him to do. Shows me how little we appreciate what we have!